Meet our incredible team of teachers from all over the world. Our teaching team at Sampoorna Yoga work together to create a supportive and nurturing environment that enables you to find a deeper spiritual awareness. We have created a sensitive, safe and spiritual space where each individual is free to express and explore themselves without expectation or judgment. Our teaching staff are a unique combination of Indian and International teachers, creating a fusion of cultures, experiences, teaching styles, approaches to yoga asanas, and a multicultural environment appropriate to the eclectic and international group of students we receive at our centerevery season. While our teachers come from a variety of cultures, countries, and disciplines, we are united in our belief that yoga is an ongoing transformative process and uphold this unique blend of East-West influence on yoga that benefit all with a deeper awareness and understanding of yoga,personally and in a global context. All of our teachers are experienced and qualified and lend their own personal style and experienceto our training courses, while at the same time staying grounded in traditional yoga disciplines. 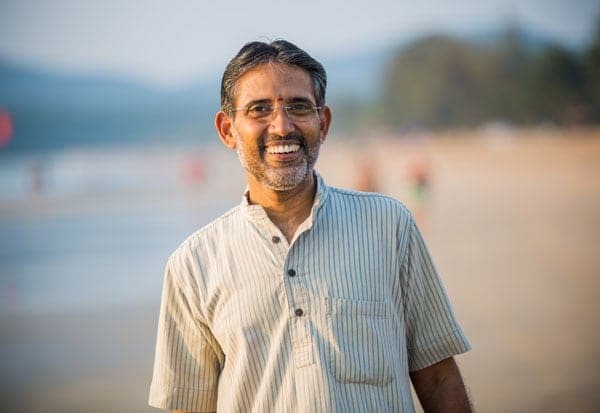 Director of Sampoorna Yoga, Goa India. Sudhir Rishi is the Director of the Teacher Training at Sampoorna Yoga. He has been involved in the fields of yoga, meditation, philosophy and Ayurveda for the last 24 years. He lived as a monk for eight years, dedicating himself to intense meditation practices. He has taught thousands of students in our yoga teacher training programs in the last five years. He also travels to different countries in Europe and Asia conducting workshops and retreats. He taught in more than 75 groups of TTC 200 and 18 groups of TTC 300 in addition to meditation courses and silent retreats. Born into a traditional Hindu family, he studied Mechanical Engineering, achieved a Master of Technology award in Quality and Reliability and worked as a Total Quality Manager in a leading automobile company in India. However, all through his career he was deeply thinking and observing life. At age 28, sudden death of his mother and inspired by Buddha and other spiritual masters, he left his highly paid job, and joined the Ramakrishna Mission as a Brahmachari (celibate monk). His quest took him to the Himalayas. Later, he joined the Swami Dayananda Ashram, in Rishikesh and studied Sanskrit, Vedic Chanting and Commentaries on scriptures of Advaita vedanta. He learnt yoga from the Balananda Brahmachari tradition and Bihar School of Yoga and did his teacher training in Ashtanga Yoga in Mysore. He also learnt and practiced TM of Maharshi Mahesh Yogi, Vipassana, Osho’s techniques and J Krishnamurthy’s teachings. During the last 16 years he has made his home near Sri Ramana Maharshi Ashram, in South India, combining his time in the Ashram with the teaching time at Sampoorna Yoga. For Sudhir, philosophy is not a theoretical pursuit but a lifestyle. For him, philosophy reveals higher truths which need to be contemplated, verified, applied and assimilated. He has had many transformative spiritual experiences and he shares his personal experiences with his students. He loves life and people. He is passionate to share his wisdom and insights with spiritual seekers. He believes, and it has been his own experience, that joy is the nature of oneself, and it has no connection to anything whatsoever, and this fact can be discovered by others as well! His simple way of teaching helps his students to know themselves better and deeper. Veena Sudhir has been involved in the fields of meditation and Ayurveda for more than twenty years. By profession, she graduated in Computer Software and Library Sciences and masters in Applied Psychology. By passion, she was naturally pulled into meditation, Ayurveda, Reiki and Pranic healing. She has been associated with Sri Ramanashram, in Tiruvannamalai for around thirty years and has spent many years studying meditation and healing practices. She has been teaching at Sampoorna yoga for number of years after completing both her 200 and 300 hour teacher training courses at the school. She also did two Yin teacher training courses as well. Veena is now a valued member of the Sampoorna teaching team, her primary role is conducting modules of our Meditation teacher training and broadening the remit of our other training with her extensive knowledge of meditation and healing practices. Veena brings much to the school through her passion and dedication to her subjects, passing on her knowledge to others is one of her greatest passions. Henrik encourages his students to find a practice they can commit to and make it a part of their daily routine. His goal is for students to practice yoga every day and not just asanas, but also pranayama and mediation. For him, Yoga is about transformation, it’s not just about the physical postures, it’s about acceptance and how to concentrate the mind. Henrik believes the most important thing is that we practice with dedication and devotion, which leads to an inevitable physical, mental and spiritual change. According to his understanding of yoga, as we get more flexible in the body, the mind becomes less rigid as well. As we grow stronger, we can stand up for what we believe in and speak up when we see injustice around us. As we gain balance on the mat, we find balance in our daily lives. Yoga has taught him not to be so hard on himself, not to take everything so seriously, and that in order to find answers; the journey needs to be an inward journey. Henrik believes that the key to wellbeing and happiness in this life lies inside of us. Having taught a lot of different classes and numerous students, Henrik has had the pleasure of seeing tremendous change in those who are devoted to a regular practice. His advice to new students is to find a teacher that speaks to them and go to the classes that work He believes that through yoga we learn that we always have a choice as to how we react to things that happen in our lives. He keeps his classes joyful, energetic, challenging, and even ‘mind-blowing’ at times. Before embarking on his spiritual journey, Henrik worked in the financial field for several top tier investment banking firms in San Francisco and New York. He is a native Swede, but spent half his life in the United States. He teaches vinyasa, hatha, yin, partner yoga, meditation, thai massage and draws knowledge from several different lineages in his teachings. Some of his main influences include Rusty Wells, Ragunath, Tony Sanchez, and Shiva Nandi. He completed the Sampoorna 300-hour training and he holds an‘E-RYT 500’category certification with Yoga Alliance US. Nowadays, he combines his time teaching at Sampoorna Yoga and also at his own yoga school in Sweden. Mine has practiced yoga and meditation for almost 20 years, and started teaching over 14 years ago. In 2007, she opened the first hot yoga studio in southern Sweden, in Malmö. Since her first official teacher training she has taught 6000 hours of classes. To emphasize the constant learning process, Mine persists in calling herself a student and her students her teachers. Mine’s experience as a teacher and studio owner, and from a range of trainings that she has led and participated in, has given her a deep understanding of a vast variety of yoga styles and of each person’s uniqueness and individual needs. It has enriched her with an excellent wealth of knowledge of yoga, alignment, therapy and anatomy which shines in each of her classes. Her compassion and her quality consistent classes makes her students leave each class feeling stronger, healthier, aware and more balanced. Before her immersion in yoga, Mine obtained a degree in Psychology and worked in the Human Resources and Recruiting fields. Today, she runs a yoga studio, holds retreats and teaches Vinyasa, Hatha, Yin, Yoga Therapy, Meditation and Pranayama. Some of teachers Mine has learnt from are Jason Crandell, Ray Long, Paul Grilley, Raghunath, Alan Wallace, Budokon University, and much more. Olivier discovered Yoga while living in London in 2003 and working as a Personal Trainer. Suffering from back pain and running injuries, yoga became an essential tool in his recovery, and later a passion in its own right. 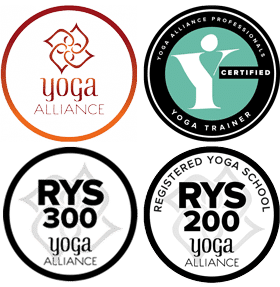 A few years later, Olivier travelled to India to pursue his first teacher training, he then returned again to complete his 500-hour Yoga Alliance certified training with Sampoorna Yoga. 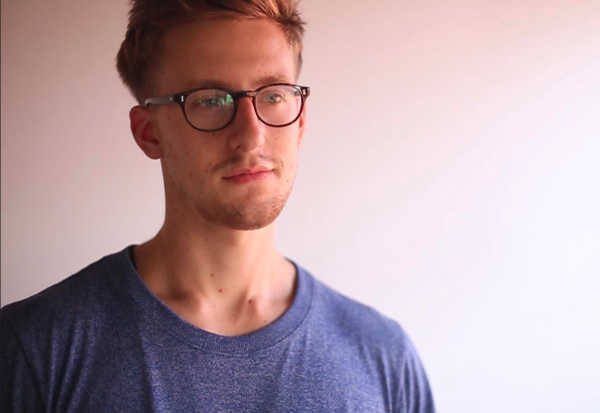 More recently, Oliver has completed the Advanced Yoga Anatomy course with Leslie Karminoff and Amy Matthews, building on his understanding of the body and yoga practice even further. Over the years, Olivier has found that the key to a successful practice is honoring the physical body’s limitations – and moving fearlessly into the possibilities of greater strength and flexibility through patient and persistent practice. He has a light hearted, compassionate and playful approach to teaching, and helps his students togrow through self-observation without judgment. Having spent time teaching on trainings and retreats in India, Europe and Japan, Olivier now owns and runs a yoga retreat centre in West Japan with his wife, Hiromi. He brings an extensive knowledge of yoga anatomy, Vinyasa Flow, Yin, Ashtanga Mysore and Children’s Yoga to the Sampoorna Yoga team. 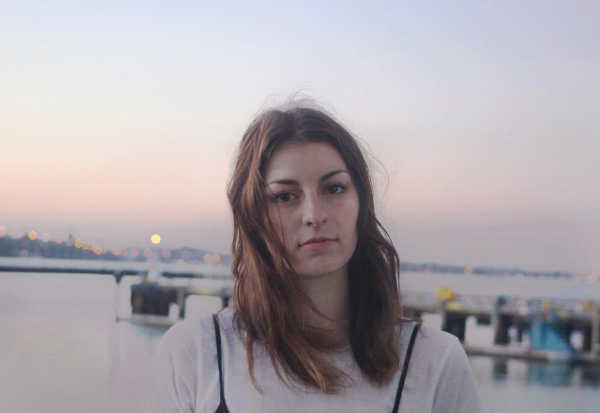 Joanna first started practicing yoga in a studio near her house in Athens, Greece. Unwilling and unable to miss any class, she knew that she had found her way to a beautiful practice, both on a physical and mental level. In her early years, in Romania, she learned ballet and modern dancing. Discipline was Joanna’s best friend since she was very small. She has a degree in Economics from National and Kapodistrian University of Athens. 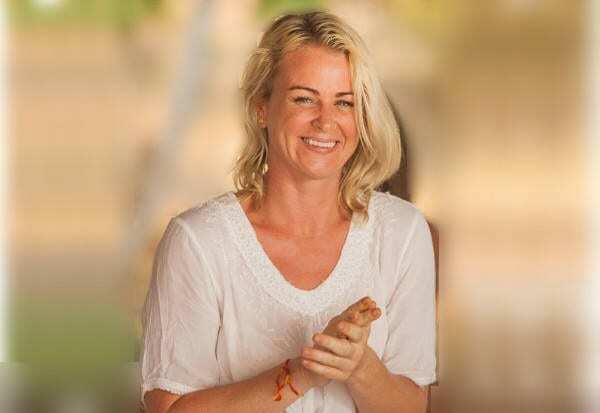 Since 2009 she has completed advanced studies, teacher trainings and workshops with first generation teachers in the Ashtanga Vinyasa tradition including: David Swenson, Eddie Stern, Kristina Karitinou, Rolf Naujokat, David Garrigues, Manju Jois, Laruga Glaser. She has completed three teacher trainings in Ashtanga Yoga and her 300hr training in Advanced Vinyasa Yoga here in Sampoorna Yoga, India. She has completed a 50 hour Teacher Tune-up with Noah Maze for whom she has a deep appreciation. She’s also a level two Thai Massage Therapist. She practices and teaches Ashtanga, Vinyasa and handstands. In her class, she emphasizes the bandhas, which are the bridge that allow us to take our practice from a merely physical level to an inner energy work. She also focuses on the breath, which is more important than the asana. “Never stop breathing”. She gives modifications for all body types as she believes yoga is for everyone – the asana is not about form but about function. She is fully dedicated to the Ashtanga practice, always looking for a teacher wherever she is traveling. 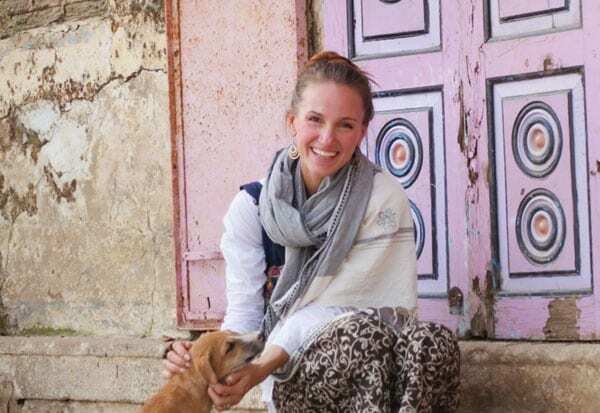 When she is India, she continues her studies with certified teacher Regina Ehlers. She hopes to inspire people to learn and keep practicing the Ashtanga Yoga method. She is funny, caring and she gives her full attention to the students. Her hands-on adjustments are amazing and she will definitely take your practice to the next level. At the moment, she is working on Secondary Series of Ashtanga Vinyasa Yoga. Alan led a rather hedonistic lifestyle up until his discovery of yoga while living in Hong Kong. Although he enjoyed his job teaching English to preschoolers, there was something missing. After signing up for a free class at his local gym, he never looked back. It was the perfect way to bring some calm into an otherwise hectic lifestyle, and it wasn’t long before the shift from party to asana addict began. Yoga ignited a passion that had been previously misdirected and kick started a positive new chapter in his life. Having been so enriched by teaching English previously, it seemed a natural progression to share his new love, and so began his journey at Sampoorna Yoga. Having completed both the 200-hour Ashtanga-Vinyasa and 300-hour Vinyasa flow courses at Sampoorna Yoga, Alan went on to train in Rocket Yoga with senior teacher Amber Gean. Alan’s style is dynamic and energetic, but playful with a strong emphasis on alignment and breath. He strives for precise technique and movement in his class, always with a focus on well-being and mindfulness. His personal practice combines Vinyasa Flow, Rocket, Dharma Mittra and just about anything that gets him on his hands or upside down, where he is happiest.When not at Sampoorna, Alan lives and teaches full-time in London. Chrissie was first drawn to yoga in 2008, at first only with the intention of getting into shape. Completely unaware of how deep the practice would take her – beyond asana and the superficialaspect of the physical effort, yoga began to uncover deeper layers within herself. She likes to challenge her students with a variety of styles, inspired by Vinyasa, Yin, and Budokon; allowing room for play, exploration, and huge smiles! She completed her teacher training at Sampoorna in 2015 and has been sharing her knowledge and infectious energy ever since. Martin started his yoga experience in 2008 once he realized that it brings him peace, relaxation and healthy balance to his otherwise sedentary and stressful corporate lifestyle of then. Starting first with traditional Hatha yoga classes, he later transitioned to more dynamic styles of Vinyasa yoga. He slowly discovered a need for deeper understanding of other aspects of Yoga and that led him to quitting his job and traveling to India in pursuit of an overall practice of all aspects of yoga. He never looked back. After first completing his 200 TTC with Sampoorna Yoga, which gave him a solid foundation to his self-practice, he continued his learning throughout his travels by attending another 200-hour Yoga training at Mahadevi Ashram in Guatemala. The art of adjustment he learned with Kamal Singh of Tattvaa Yoga Shala in India. In 2018 he completed 40hours Teacher Training Course with David Swenson in Italy. David is one of only handful of Westerners to have learned the full Ashtanga system as originally tought by K. Pattabhi Jois. He attended workshops with David Robson at Purple Valley in Goa, India. He continues his studies with certified teacher Regina Elhers in India. Needless to say, Martin mostly learned from his daily practice of Ashtanga Vinyasa Yoga which he has been maintaining for past years. The practice is his best teacher. Martin has a great sense of humor that he incorporates in his classes. He facilitates, encourages and inspires his students with his devotion and knowledge of the practice. It is up to the students to use those tools in their practice. Having always led an active life, Rowena first started practicing yoga asana in 2008 as a means for balancing out her many other physical pursuits. It was not long until the practice began to open up a deeper level of awareness of body, mind and spirit. Soon, yoga asana became Rowena’s main physical pursuit. After attending a two-week Ashtanga retreat with Harmony and Jeff Lichty in November 2013, Rowena returned to London and continued with a daily Ashtanga Primary Series practice, in addition to her already regular Jivamukti practice. These two intense and deeply spiritual practices triggered her curiosity, opening up a desire to deepen her own practice and gain a better understanding of what Patanjali referred to as the eight limbs of yoga. It was this desire that propelled her to embark on a 200-hr Ashtanga-Vinyasa training, which she completed at Sampoorna Yoga in January 2016. Since then, Rowena has gone on to practice and study yoga under the guidance of Sharath Jois at KPJAYI in Mysore. In 2017, Rowena went on to complete a 300-hr training in the Jivamukti yoga method. These enriching experiences and all of her teachers are the inspiration behind the style of yoga that Rowena teaches. Combining pranayama, vinyasa and mediation, Rowena’s classes focus on awakening the senses, bringing students in tune with their bodies to reveal the strength and grace we all have inside. Kimber was drawn to yoga over a decade ago as exercise when she was not interested in running or lifting weights in a gym. With a continuous practice, she soon realized her mat became the place with the most inner silence, her safe space, a major contrast to her chaotic daily life and struggle with depression. With understanding the effects a yoga practice has on her mind and body, she felt a strong desire to share the practice with others. Since completing a 200-hour Yoga Alliance accredited teacher training in 2015, she has been encouraging self-exploration in others and helping them to find more silence within. Kimber continued her education with a Sampoorna Yoga 300-hour teacher training in 2017. Her classes are creatively sequenced to provide a space to safely explore the body and mind within the four corners of the mat through fun, playful and mindful asana flows, including Vinyasa, Hatha, Ashtanga, Yin, SUP Yoga and Kids yoga. Her classes also incorporate aspects of pranayama and guided meditation, providing a well-rounded yoga experience for her students. Vera began practicing yoga while living in San Diego, California in 2010. It was love at first sight, and after her first yoga class she never looked back. As soon as she entered the yoga room, she knew she was home, the home of her heart. Since then, she had taken various trainings and workshops around the world. Nowadays, Vera is a 500-hours certified yoga teacher. She did her first 200-hour training with CorePower Yoga and then completed her 300-hour training at Sampoorna Yoga. She is also a certified aerial yoga and yin yoga teacher. She mostly practice and teaches vinyasa, yin and aerial yoga. Vera encourages her students to build greater self-awareness and peace through their yoga practice, empowering them to release, to let go and to discover themselves, in a safe comfortable ambiance. She strives to inspire her students to foster an interest in slowing down, paying attention to the subtle things, and remembering their innate ability to heal themselves. She places emphasis in breathing, safety, postural alignment while practicing in a loving-playful atmosphere. Vera believes that through yoga we can create the change we need and bring peace and joy to ourselves and others. She feels blessed and grateful to be able to share her love for Yoga with others. Along with her yoga journey, Vera loves to travel and has visited many countries over the years. Born and raised in Italy, has lived for more than 11 years in California, USA. 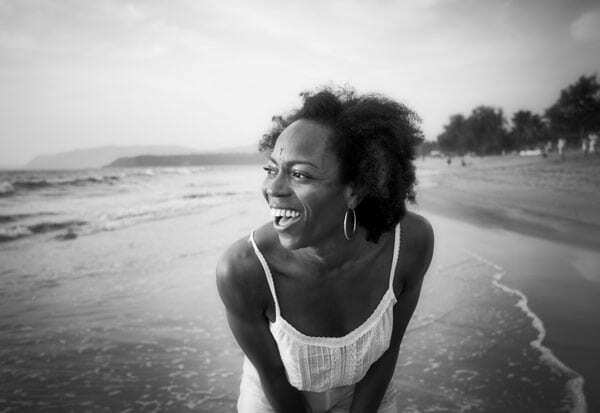 Before dedicating her journey to yoga, Vera worked in the field of communications and marketing. She also has a master and a doctoral degree in Business Administration. Karen started yoga over thirteen years ago after a suggestion from a friend to heal a chronic back pain, due to a fast and physically emanding lifestyle. The physical benefits and challenge were the first attraction, but with more practice in many different styles of yoga, she began to notice positive and naturally occurring changes in her whole being and lifestyle; and fell madly in love with yoga. Karen completed her 200hr & 300hr Hatha yoga teacher training at the Sivananda Ashram in Neyyar Dam, Yin yoga 40hr training in London with Norman Blair and 300hr Vinyasa training at Sampoorna. After such a beautiful transformative experience at Sampoorna, Karen returned to learn and share more as a karma yogi. Life philosophy: be aware, be present, and face the joyful and challenging as learning and experience; there will always be both, but what you feed grows. Not every day is a good day but positivity can go a long way… it’s a practice: concentrate, practice, fall, learn, then get back up. Smile. Be persistent. Jenna shares the Ashtanga System of Yoga with passion. As a devoted practitioner and Sharer she weaves the philosophy and 8 limbs of yoga into her teaching and supports students with the application of this in their every day life. 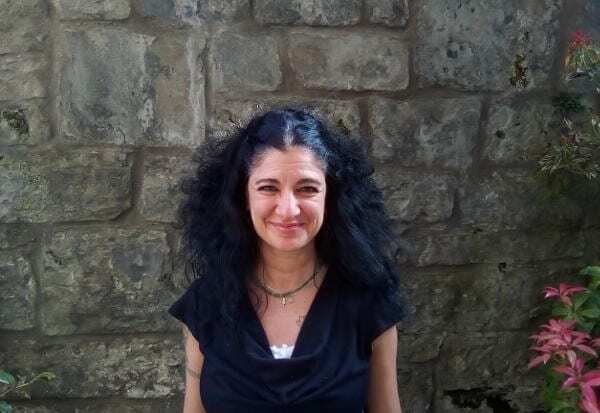 Jenna has studied with her own teacher around the world and has taught numerous workshops and specialised classes in group and private settings for mental health, disability and young people across UK, Europe and India. Jenna’s approach to teaching is steeped with compassion, reminding students that the physical practice of Asana, which literally translates ( ‘To take ones seat’ ), is a dynamic meditation, to prepare the body for more subtle states of being. She will meet you exactly where you are in your practice, giving you enough space to express yourself to go beyond your physical and mental limitations, whilst embodying the posture in your own anatomy. Yoga begins by listening. Sometimes there is so much noice in the head; we can’t hear our own inner, higher self speaking. Rowie’s yoga teaching story began in 2011, completing her 200-hour training with us at Sampoorna and returning in 2014 for her 300-hour TTC. Her personal yoga story began several years before when she attended her first yoga class with her father at age 15. Rowie has spent a lot of time travelling the world and has been lucky enough to train with some of the most acclaimed international teachers such as Les Levanthal, Megan Currie, Ana Forest, Pradeep Tetioa, Magdelena McWeld, Patrick Beach and Dana Trixie Flynn, to name a few. From vinyasa flow to the slower, yin training courses, Rowie’s classes are strong, challenging, fluid and always a little different. Under her guidance, expect to find a real break from whatever else is going on in your life. Rowie believes that practicing yoga is life changing in every sense of the word. She loves that it keeps you supple, nimble, and flexible both physically and mentally. As a true believer that yoga can benefit people’s lives, Rowie is happiest when teaching. 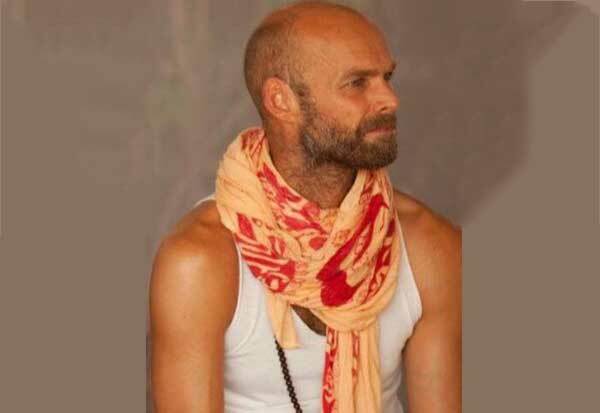 Sean is a movement enthusiast, trained primarily in Ashtanga and Vinyasa in Goa, India. In the last year alone he assisted on five teacher trainings (TTC200) in Sri Lanka and in India. 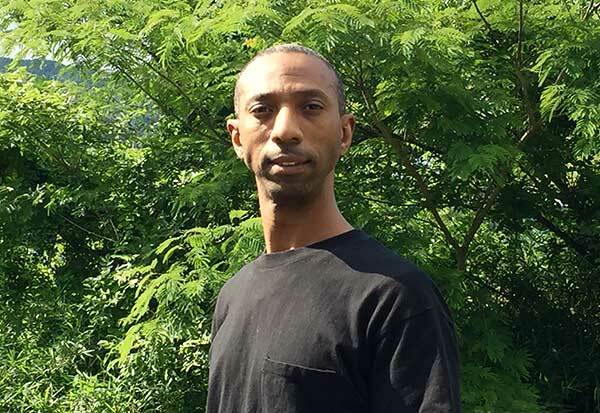 Though his background education is in Speech, Language Pathology and Communication from University of Sheffield and BA (Hons) in English Language from university of Manchester, his passion is Yoga. He is working at Prana Lounge, a wellness center in Colombo, Sri Lanka teaching more than 10 public classes and 7 private classes a week. He is into practice and teaching of Ashtanga Primary Series. Interested in establishing good movement patterns, Sean ensures secure fundamentals are in place before adding the ‘fun’ stuff. Incorporating strength (through the discipline of Ashtanga) and the creativity (through Vinyasa). His classes are dynamic, thorough and punctuated with movement tips acquired from Yoga, gymnastics and climbing. His understanding of the physical practice, which is forever evolving, is to create more space in the body, physically, to enable more space for the breath. As the breath becomes fuller, longer and deeper so too does the life and a calmer breath leads to a calmer mind. Managing Prana Lounge in Sri Lanka has provided him with insights into the ‘business of Yoga’ to help students in that direction. He also worked as an Independent Speech and Language therapist, supporting people of all ages, physical and cognitive capabilities helped in understanding difficulties and opportunities in Yoga as a profession. Also worked as an International Supervisor at Sri Lankan Volunteers. His role was to train, manage and support approximately 100 volunteers per month who came to Sri Lanka to gain experience working in mental health hospitals and schools for children with additional needs. All this helped him to help his students in not only in their yoga training, to make them better teachers and also to apply this to life. Facing struggles in her younger teenage years Lisa began yoga at the age of 15 after hearing about the mental and physical benefits. What started out as a casual weekly practice grew into a journey of transformation and realization of the deep and powerful healing yoga has to offer. This lead her to exploring different styles from Bikram to Yin, taking meditation classes and being drawn to books and podcasts around yoga and spirituality. She completed her first 200-hour training with Sampoorna and returned the following year as a karma yogi to assist in teacher trainings and teaching number of drop in classes. Her classes were highly appreciated for their sequencing, creativity, clarity and authenticity. Always seeking to remain a student, this year she has taken a 250-hour training with The Ralston Method in New Zealand. Teaching Vinyasa and Anatomy are her passion and specialization. Since her childhood involvement and training in rhythmic gymnastics and ballroom dancing Lisa has become very passionate about movement. She has maintained her connection to dance and has been leading group classes, so teaching yoga came as a natural progression. For Lisa, practicing and teaching yoga is about helping to create the most fulfilling experience of life and spreading joyful energy. She encourages students to use their mat as a way to explore and learn to navigate their mind and body, leading to finding comfort, happiness and peace within themselves. She has a strong emphasis on teaching safe alignment and mindful movement to be able to sustain a life long practice. She has her unique way of encouraging students to develop their own authentic vinyasa styles of practice. Athena trained as a classical and contemporary dancer in 1992 continuing her professional dancing and teaching career until her forties. She ran her own ballet school and contemporary dance company in Cyprus for 10 years and a yoga studio for 5 years. She came across an Ashtanga yoga class while traveling through New Zealand in 1998 and was hooked! It was so refreshing to have the discipline that she knew her whole life from classical ballet training but at the same time without the competition and pressures of the dance world. She continued developing her self practice until she decided to take a teacher training with David Swenson in 2004. She has practiced and taught since then, always continuing to learn and to explore the different qualities that Ashtanga brought out in herself and in her students. In the last 10 years she has taken many workshops in Vinyasa and Ashtanga Yoga which has helped her develop her own style of teaching. She has a great interest in the anatomical side of yoga and has a great eye for alignment. She took a 200hrs Yin Yoga Teacher Training in 2018 and completed her 300hrs Teacher Training in Vinyasa with Sampoorna in February 2019. Her classes are challenging but always with a fun element as she believes that even though she takes her work seriously a sense of humour is always necessary! She never stops learning and feels that the more you know, the more you realize the less you know! She has also just completed a two year course in Clinical Canine Massage Therapy. This way she can fulfill her other passion which is helping dogs lead happier lives. At the moment she lives in Edinburgh with her partner and their 2 dogs and 2 cats.